I've downloaded filezilla on Ubuntu 14.04 using the package manager (apt-get) and I'm currently setting up a site to transfer files for on the remote server I'm using. For the login type, I need to use private key, but its not listed as an option. Did I install the wrong version of FileZilla or something? I tried to upgrade the installation but it says that FileZilla is up to date. Any help would be appreciated, this is my first time using sftp. You have to configure the key authentication. Open the menu Edit > Settings… and navigate to Connection > SFTP. Add the key files and you're done. The fix for me was to switch the logon type to Key File. In my case, I have an Ubuntu user with the correct permissions which I used the link below to configure. I had tried the answer above, but it did not work. I guess it may have if the user was in fact root? Not the answer you're looking for? 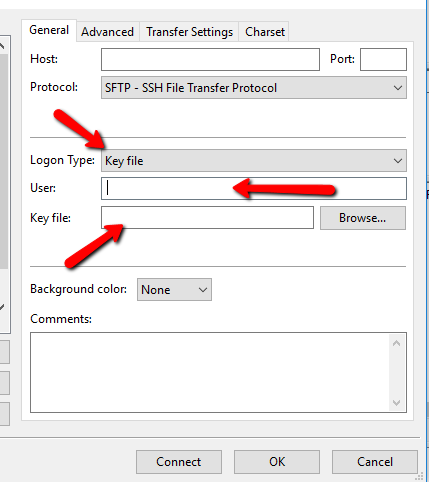 Browse other questions tagged 14.04 ssh authentication sftp filezilla . Why can't Filezilla quick-connect to Sourceforge any more? What's the password of an SSH private key? How install the latest FileZilla from its official site?